Hopefully it's alright to post this here! As some in the Facebook realm are aware, I am now an engaged man (As a side-note, yes JD and co. you're invited Appreciate the kind words). Due to our relationship being a cross-continental one, we're having to slap together a wedding a lot sooner than we would usually plan - but it's all coming together beautifully for a nice February 21st wedding in Portland, Oregon. However! My lovely Fiancé presented me a honeymoon option that tickled my fancy. Lying in bed the other day she said "well we could do Bora Bora" (which I've always wanted to go) - but then she said "Ooorrrr" and pointed at the big Bill Shankly flag I have hanging in my room. Which obviously she had me at "Orrrr"
Having double-checked a few times that this would indeed be as fun for her as me (she does love her footy, actually quite the handy player) I looked up the schedule and see that on the 27th Feb there is the home derby v the blueshite, then a few days later a home match vs City. One could not ask for a better little run of games for a honeymoon trip to base around. Of course, at this point I'm stumped as I have no f**king idea the best way to get tickets and all. Know they are not on sale yet but being the games I know they'll be high demand and that we it could be hard to get. SOOOO I'm putting the call out to my Red brethren - tips/assistance/anything to help us plan the best f**king honeymoon of all time? Can't wait to finally meet up with some for a pint or ten as well! I'm sure somehow we will be able to sort you out! Tickets should go on sale end of this month or start of next - always the option of hospitality as a last ditch resort too! Congratulations again on your engagement! Enjoy the planning! As far as tickets go, I think you'd be incredibly lucky, particularly against the Bitters. Back for my 21st we were due to play the Bitters and Cas managed to sort a couple of tickets for me, at the expense of herself and Kenny if I remember rightly..unfortunately the game was later moved to midweek due to us getting to the Carling Cup final and I wasn't able to get it off work. Other than a massive stroke of luck or an incredibly generous gesture/help from a season ticket holder, I think you'd be unlikely to get a ticket. Had considered that it would be incredibly hard for those two. However being the special occasion, in both our first times to a game and most importantly, the honeymoon, we're prepared to do whatever it takes to get to the games and do it right. So if last resort is hospitality then that'll be the case! Appreciate any advice and help from on the ground there though, will keep eyes on that second half release and all. Extra pints for all! I was blessed to be looked after by a lovely and awesome forum poster in the identical scenario as yours Dave. Went to Anfield for the first time on our honeymoon Sept 2013 I would suggest you spend a few days at least in Liverpool lovely city lots to see and do there! P.S Congrats on the engagement mate! P.P.S My condolences you poor b***ard! Yeah I we both definitely want to see the city a bit while we're there, may look in to the real nice tour packages for Anfield and all that in between. As well as some boozing and fun and whatever. But yeah, the games is what we're all about for those few days. Probably even embrace being the fuckers with jerseys that say "Just Married"
Seriously though, appreciate the kind words from all and the help - this thread may get a workout for the next few months! Congrats on the engagement mate and what an awesome honeymoon you're planning. Knowing how amazing Liverpool fans are I'm certain, in fact I'd put money on you getting tickets and I don't bet. oh mate you know the three stages.Engagement ring,wedding ring ,suffering. Best Wishes to you both,I will do my best to see if I can obtain a pair of tickets for yez!.I have various friends who may not be able to attend these games so they give me their seats to sell on at face value,if any do arise for said games I'll make sure your names on them. Best of Luck El Batez. P's you can stay in touch through fb also Allan Bates and Lfc Tickets fb would be glad to add you. Definitely look in to The Shankly Hotel for accommodation. Not sure of cost but if the bar and restaurant area is anything to go by then I'm sure it would be a quality place to stay. good for you mate nothing quite like a good woman in your life. I don't know if it makes a difference, but if we play in Europe before the Everton game, the Everton and City home games will be moved to the next day. Even if we don't, it's quite likely tv will move them to the next day anyway. The current dates shown are not confirmed. 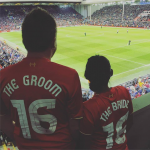 On ya mate, congratulations and the best of luck to you both. Appreciate that mate! Will keep in touch. First one I looked at Very real possibility, price dependent of course. Congrats BigV...made up for you and the missus. Maybe you can stay at Brendan's old place...heard it's up for rent. Hoping to just go straight into LPL, but if we do go that way then appreciate the tip - will likely book it all up ASAP so will be sorted with plenty of time to spare. Question RE: Match tickets. Is it worth myself getting a membership to try and get on to the tickets myself, and how many tickets can be bought on one membership. I'd possibly get one if that would help, as the 10% discount on merch will probably make up for it anyways by the time I've taken myself and the missus through the store Just wondering if it'll help in any significant way on the ticketing front. EDIT: A bit of googling led me to the offals FAQ which it appears it is only one ticket per membership, as I had assumed but. Still, if it makes it much more likely to get tickets I may go for a couple for us still. Any advice welcome! EDIT #2: Also, is there any ticket reseller websites that people know are legit as far as getting tickets? Obviously the prices are shithouse going that way, but if needed then just want to know what people think. Don't think any of the reseller sites are legit mate. I did observe when I went in September two dodgy looking fellas trying to tout some tickets minutes before kick off. Don't know how legit their tickets were or how they were obtained but I imagine a high profile game like City or Everton they would be asking for an arm and a leg. Dave, regarding membership, it won't be worth it for you as you need credits on the card from previous matches to qualify for big games anyway. I have only stayed overnight on once, for the game against Derby in October 1990. It was worth it though as the 2-0 win put us well clear at the top of the table with 24 points from 8 games, and it was only a matter of time before No. 19 was wrapped up.